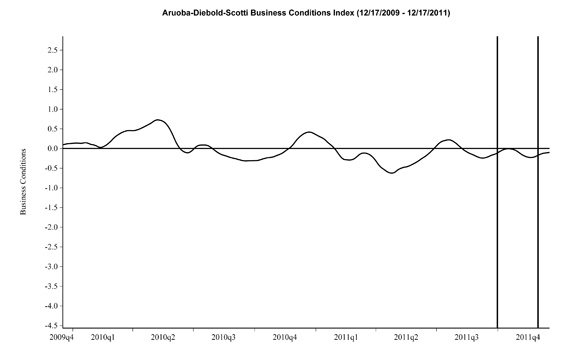 In yesterday’s post (“4 Confidence Charts – December 2011“) I displayed four charts indicating various long-term consumer and small business confidence readings as compared to the S&P500. There are a few aspects of the above charts that I find highly noteworthy. Of course, the continuing very subdued absolute levels of these two surveys is disconcerting. While I don’t believe that confidence surveys should be overemphasized, I find these readings to be very problematical, especially in light of a variety of other highly disconcerting measures highlighted in this blog. This entry was posted in Uncategorized and tagged Consumer Confidence on December 30, 2011 by Ted Kavadas. This entry was posted in Uncategorized and tagged Consumer Confidence, small business on December 29, 2011 by Ted Kavadas. Gold has recently been in a correction (or consolidation) after a very steep rally. From an overall Technical Analysis standpoint, on both daily and weekly viewpoints, Gold appears vulnerable to a (significant) decline. This entry was posted in Investor and tagged gold on December 28, 2011 by Ted Kavadas. 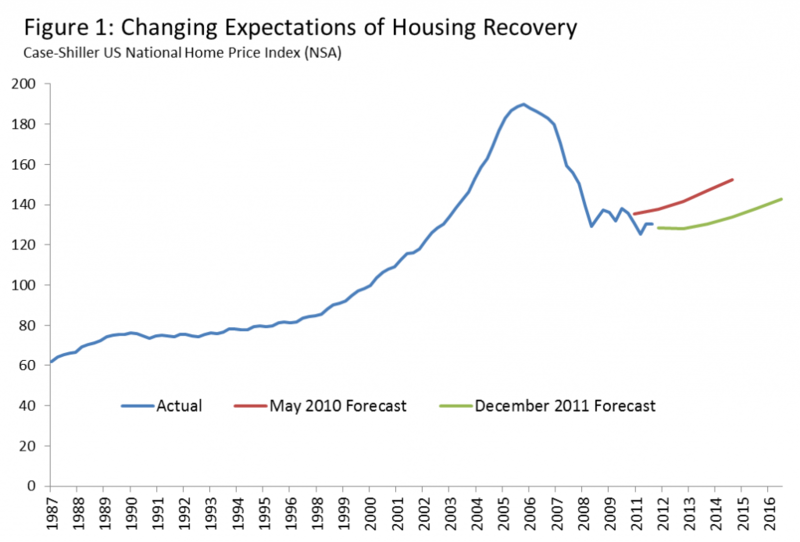 On December 20 Zillow released its December 2011 Home Price Expectations Survey results. 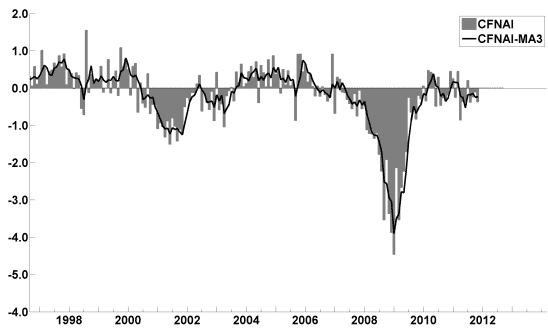 This survey (formerly called the MacroMarkets Home Price Expectation Survey) is done on a quarterly basis. As one can see from the above chart, the average expectation is that the residential real estate market, as depicted by the Case-Shiller US National Home Price Index (NSA), will slowly climb (on a cumulative basis) through 2016. The survey detail is interesting. Of the 109 survey respondents, 9 (of the displayed responses) foresee a cumulative price decrease through 2016; and of those 9, only 3 foresee a double-digit percentage cumulative price drop. Mark Hanson remains the most “bearish” of the survey participants with a forecast of a 25.17% cumulative price decline through 2016. The Median Cumulative Home Price Appreciation for years 2011-2016 is seen as -2.00%, -1.99%, .29%, 3.01%, 6.96%, and 10.63% respectively. For a variety of reasons, I continue to believe that even the most “bearish” of these forecasts (as seen in Mark Hanson’s above-referenced forecast) will prove too optimistic in hindsight. Although a 25.17% decline is substantial, from a longer-term historical perspective such a decline is rather tame in light of the wild excesses that occurred over the “bubble” years. This entry was posted in Real Estate and tagged MacroMarkets, Real Estate, real estate bubble, residential real estate on December 27, 2011 by Ted Kavadas. Included in the story, 10 “stock-market strategists and investment managers” give various forecasts including 2012 S&P500 profits, 2012 S&P500 year-end price targets, 2012 & 2013 GDP growth, and 10-Year Treasury Note Yields. The mean prediction of the 10 stock-market strategists and investment managers surveyed by Barron’s is that the Standard & Poor’s 500 Index will end 2012 at about 1360, some 11.5% higher than Friday’s close of 1220. The top-down call, or that of Wall Street’s market strategists, is that earnings per share will rise about 7% in 2012, to $105, for companies in the S&P 500, from this year’s estimated $98. The typically more optimistic bottom-up crowd of industry analysts calls for a 10% increase, to $108, although that forecast is down from an estimate of $113 in July. This entry was posted in Investor, Stock Market and tagged S&P500, S&P500 Earnings, Stock Market on December 22, 2011 by Ted Kavadas. The commentary largely focuses on the housing market and when the economists polled believed it might recover. The economists’ predictions reflect a market that is at or near a bottom and showing signs of stabilization. New construction in 2011 is forecast to be mostly steady with a year earlier at around 600,000 homes and climbing to around 720,000 in 2012. But recovery may still be some time away due to several factors. Goldman Sachs economists Hui Shan and Sven Jari Stehn last week said their model for home prices indicates a bottom some time in 2012. They note that affordability has improved in recent years, helping the market to stabilize but other factors are preventing the sector from taking off. Also, as seen in the Q&A section (in the spreadsheet), the economists put the probability of a U.S. recession in the next 12 months at 23%. This entry was posted in Economic Forecasts and tagged Economic Forecasts on December 21, 2011 by Ted Kavadas. On October 17 I wrote a post titled “Danger Signs In The Stock Market, Financial System And Economy.” This post is a brief third update to that post. My overall analysis indicates a continuing elevated and growing level of danger. I have written numerous posts of some of what I consider both ongoing and recent “negative developments.” These developments, as well as other highly problematic conditions, have presented a highly perilous economic environment that threatens the overall financial system. The “downside” of potential price depreciation among many asset classes is substantial, as many asset classes are currently “asset bubbles,” a topic that I have extensively written about. As far as the stock market is concerned, I don’t believe the October 4 1074.77 low on the S&P500 will prove to be a “lasting bottom”, and the dynamics as described in the October 20 post (“Thoughts On The Next Stock Market Decline“) and other disturbing long-term “downside” considerations still apply. This entry was posted in Investor, Stock Market and tagged building financial danger, S&P500, Stock Market on December 20, 2011 by Ted Kavadas. 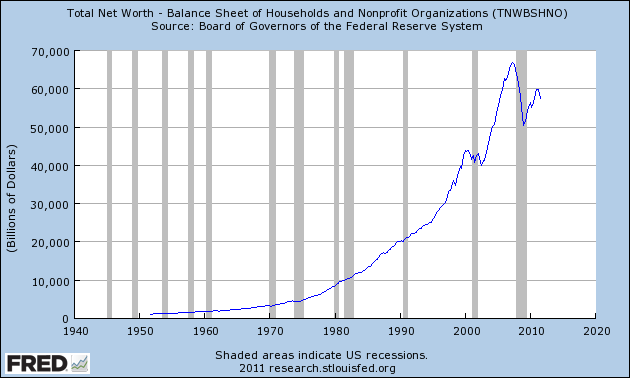 In the December 13 post (“Total Household Net Worth As A Percent Of GDP 3Q 2011“) I displayed a long-term chart depicting Total Household Net Worth as a percentage of GDP. This entry was posted in Uncategorized and tagged household net worth on December 19, 2011 by Ted Kavadas. This entry was posted in Investor, Stock Market and tagged S&P500, Stock Market on December 15, 2011 by Ted Kavadas.